Sharon Elizabeth’s Floral Designs was established in February 1986 by childhood sweethearts Sharon Elizabeth Locke and Sebastian Malespini. 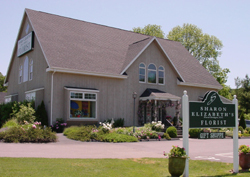 On June 11, 1988 Sharon and Sebastian were wed., and together have built one of the most successful flower shops and special event decorating studios in Connecticut. Today, the creative spirit that founded the company lives on in trademark floral and wedding designs. The designers and staff offer unparalleled levels of service. All employees are highly trained and knowledgeable about flowers and their care. As the business grew, so too did the company. In 1998, they completed construction of a 6000 square foot showroom and design studio. Special Hours January - February 2018 : We will be open Tuesday through Friday, 9am to 5pm and Saturday 9am to 4pm. We are closed on Sundays and Mondays. Starting in March, we will resume our regular flower shop hours. Regular shop hours are Monday through Fridays from 9 am to 5 pm. We are also open on Saturday from 9 am to 4 pm. We are closed on Sundays. You can email us anytime at comments@flowersbysharonelizabeths.com or call us from anywhere at 888-828-9991. If you are in our area, you can reach us at 860-828-9991. You can also contact us via our online customer service, just click here. For questions regarding your online order, please have your Netticket number available. Berlin, East Berlin, Kensington, Cromwell, Rocky Hill, Newington, Plainville, and New Britain. For all other Towns and States we will use our wire service to send your order to a local florist in the subject area. Please call our shop at 1-860-828-9991 if you have any questions or need any assistance.